The TMS (Tension Myoneural Syndrome) concept was developed from the early 1970’s by John E Sarno MD, who was a Professor of Rehabilitation Medicine at the New York University School of Medicine. Unfortunately due to existing medical beliefs, despite continually demonstrating the highly successful outcomes of his patients, he has faced great resistance. Changing widely accepted beliefs is always going to be challenging though. e.g. something that faced great resistance even after the evidence was found was the fact that washing hands could dramatically reduce mortality rates of new Mothers after delivery and of soldiers with wounds that needed dressing. In the 1970’s Dr Sarno began asking himself the type of questions I had been asking myself for years, including why conventional approaches for chronic pain were not more successful. While taking patients’ medical histories he found that 88% of his patients already had symptoms that many people recognized to be caused by stress, in other words, emotionally induced. These included conditions such as ulcers, heartburn, IBS and tension headaches. Dr Sarno began to recognize that chronic pain had the same underlying cause and over years developed his own unique approach to chronic pain, demonstrating exceptional results for conditions that many people believed to be incurable. He coined the term Tension Myositis Syndrome initially, which he shortened to TMS, but over time he then changed this to Tension Myoneural Syndrome to encompass the involvement of nerves in the process. 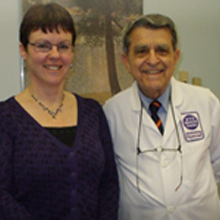 John E Sarno MD has sadly passed away but he has left a wonderful legacy for followers, like myself, to continue to develop for the future benefit of people suffering from TMS. His work with TMS over more than 4 decades provided the basis for my own work from which SIRPA has grown. The SIRPA Recovery Programme is a result of my own work since my visit to Dr Sarno in 2007 and now includes a large amount of information, advice, strategies and other self help exercises that are helping people accept and recover from stress-induced symptoms or TMS.